Ninety-nine years ago tonight the British warship HMS Hampshire sank just off the coast of Orkney, in the north of Scotland, leading to the loss of 737 men, including Britain’s Secretary of State for War, Earl Kitchener. The ship was taking Kitchener to Russia for secret talks when, at about 7.45pm, she hit a mine in atrocious weather conditions and sank in about 15 minutes. For many years it was thought more than 600 men were lost, including Kitchener, but now our Kitchener & HMS Hampshire Memorial project has discovered the true figure to be 737. This week we issued a press release – reproduced below – to mark the anniversary and to announce, and explain, this shocking new death toll figure. Our project is to “better remember” all the men who were lost by building an HMS Hampshire commemorative wall, engraved with all the men’s names, alongside Orkney’s Kitchener Memorial, which we plan to restore. Volunteers working on a planned commemorative wall to more than 700 men lost on HMS Hampshire in the First World War believe they have identified all the men on board, 99 years after the sinking. The warship sank off the coast of Orkney on 5 June 1916 while taking Earl Kitchener, Britain’s Secretary of State for War – famous for the “Your Country Needs You!” recruitment posters – to Russia for secret talks. There were only 12 survivors. 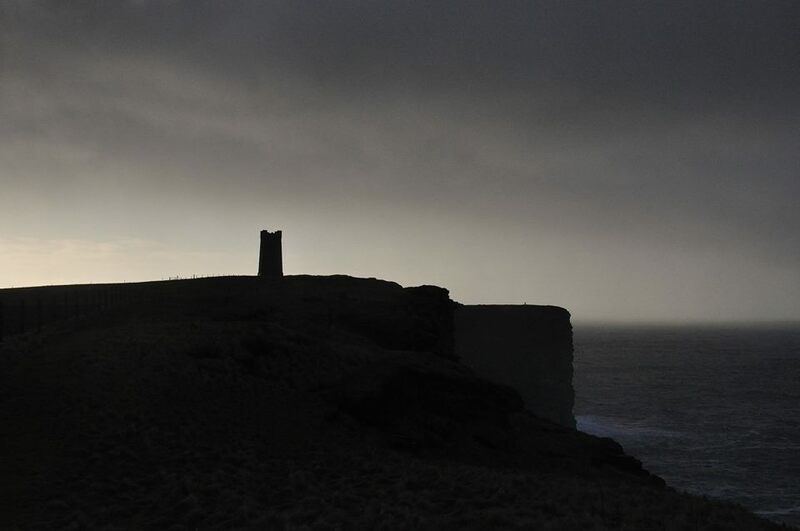 Ten years later the Kitchener Memorial, a 48-feet high stone tower overlooking the site of the sinking, was unveiled on cliffs at Marwick Head, on the Atlantic west coast of Mainland Orkney. It has a plaque which only makes brief reference to the men lost with Kitchener. But those working for Orkney Heritage Society’s Kitchener & HMS Hampshire Memorial project want to “better remember” all those lost by building an arc-shaped low wall, engraved with their names, alongside the memorial. It was long believed that 643 men died after HMS Hampshire hit a mine in stormy weather but recent research by Orkney historian Brian Budge discovered the names of more than 730 men who were lost, with many of the additional names being part of Kitchener’s party. Now project committee member Andrew Hollinrake has researched online and travelled from Orkney to spend hours digging through hundreds of files at The National Archives in Kew, London, to arrive at a final figure of 737 men lost, including Kitchener. Part of his research involved untangling two family names which had been wrongly joined together. Andrew explains: “Brian Budge had compiled a list of names from various sources including the Commonwealth War Graves Commission website. This included 723 members of the ship’s complement, and most of Kitchener’s party. But more than one source referred to other, previously-unnamed civilian staff on the mission to Russia, suggesting that there were as many as 13 accompanying Kitchener. 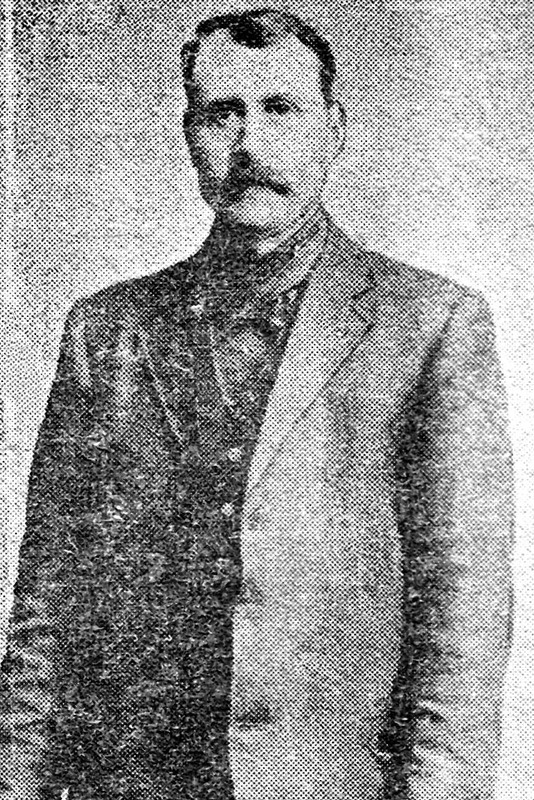 “One of the party, Kitchener’s personal servant, was named by many sources as Henry Surguy-Shields. I discovered that this was an error, and the name listed had been a misreading of a press bulletin naming Henry Surguy and “—- Shields”, with a dash in place of Shields’ forename being mistaken for a hyphen, and so misread as a double-barrelled name. “I visited the National Archives and, after sifting through several large volumes of documents relating to the sinking, I found not only a detailed list of the sailors lost, but also a complete list of Kitchener’s party. This included William Shields, a former soldier, valet to Lt Col Fitzgerald, Kitchener’s military secretary. “Also listed was Frank West, personal servant to Sir H.F. Donaldson, another key member of the mission as a technical advisor to the Ministry of Munitions. I was already on the trail of West, since I’d found a reference to him in a family tree published on Ancestry.co.uk, but it was good to confirm his presence from an official, primary source! The proposed commemorative wall’s arc shape was chosen following a public consultation. Planning permission for the wall, a little over a metre high, is being sought from Orkney Islands Council. The project team also plan to restore the existing Kitchener Memorial to its original condition, retaining its iconic profile. The restored tower and the commemorative wall are to be officially unveiled at events marking the centenary of the sinking on Sunday 5 June 2016. Relatives of those lost, including Kitchener, are expected to attend. Anyone who wishes to donate towards the £200,000 cost can do so online at justgiving.com/orkneyheritagesociety/. The project committee is also applying for grants towards the cost and has already secured a £50,000 grant from Orkney Island Council’s Community Development Fund. Anyone without computer access who wishes to donate may send a cheque, payable to Orkney Heritage Society, to Orkney Heritage Society, PO Box 6220, Kirkwall, Orkney, KW15 9AD. We are delighted to announce the Kitchener & HMS Hampshire Memorial project has launched a JustGiving page to allow anyone who would like to help the project financially to donate. 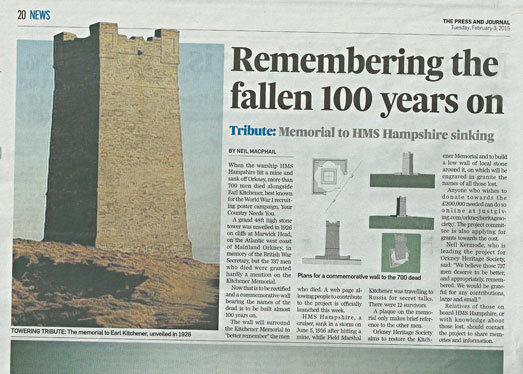 This is an important step towards our aim of restoring the Kitchener Memorial and creating a commemorative wall around the memorial, engraved with the names of more than 700 men who were lost on HMS Hampshire in 1916. We announced this development with press releases to the media both in and out of Orkney. As a result we received handsome coverage in our local newspaper The Orcadian and in the Press & Journal. Neil Kermode, who chairs our project, was interviewed by Fionn McArthur from the ever-helpful team at BBC Radio Orkney (Interview at 24:30). The Orcadian also published a shorter online article, and The Scotsman newspaper published a story in its online edition. Look out for more coverage to come. To allow those of you following the project an insight into our thinking, and the story of HMS Hampshire, we reproduce below the press release which went to the media outside Orkney. Thank you for your interest in the project, and for the generous donations we have already received. A commemorative wall bearing the names of more than 700 men lost when their warship sank in the First World War is to be built in Scotland. The wall will surround Orkney’s Kitchener Memorial in order to “better remember” those who died alongside Earl Kitchener on HMS Hampshire. A web page allowing people to contribute to the project is officially launched this week. HMS Hampshire sank in a storm off Orkney on 5 June 1916 after hitting a mine. It was long believed that 643 men died but recent research suggests it was 737. There were 12 survivors. The Kitchener Memorial, a 48-feet high stone tower, was unveiled in 1926 on cliffs at Marwick Head, on the Atlantic west coast of Mainland Orkney. The site is within an RSPB reserve and offers stunning views. Earl Kitchener was a member of the British Cabinet and Secretary of State for War when he died. He was travelling to Russia for talks. He is perhaps best known today as the face of the “Your Country Needs You!” recruiting posters. Anyone who wishes to donate towards the £200,000 needed is welcome to do so online at justgiving.com/orkneyheritagesociety/. The project committee is also applying for grants towards the cost. Neil Kermode, who is leading the project for Orkney Heritage Society, says: “As the centenary of the loss approaches, we believe those 737 men deserve to be better, and appropriately, remembered. I also believe there is unanimous agreement locally for this idea and great interest further afield. A planning application has been submitted to Orkney Islands Council for work to restore the Kitchener Memorial. Soon a planning application will be submitted for the wall, which will be a little over a metre high and built around four sides of the memorial. HMS Hampshire, a Devonshire-class armoured cruiser, was launched in 1903 and went into service with the Royal Navy in 1905. She took part in the Battle of Jutland on 31 May 1916. A few days later, on 5 June, she left the Royal Navy’s anchorage at Scapa Flow, Orkney, bound for Russia. Earl Kitchener was on board, heading for secret talks with Britain’s war-time ally. But at about a quarter to eight in the evening, in stormy conditions less than two miles from shore, she struck a mine laid by a German u-boat. Only 12 crewmen survived. It was long thought that Earl Kitchener was one of 650 men lost from HMS Hampshire. But recent research by local historian Brian Budge suggests the final death toll was as high as 737. A planning application has been submitted to Orkney Islands Council for work to restore the Kitchener Memorial. The plans would see the stonework restored to its original condition, the roof inspected and repaired, the ventilation reinstated and the former inspection doorway in the memorial restored. A second planning application is being submitted for a low wall, a little over a metre high and made from local stone, around four sides of the Kitchener Memorial. The names of the 737 men lost would be inscribed in granite on this wall. Relatives of those who were on board HMS Hampshire, or others with knowledge about those lost, are invited to contact the project to share memories and information (email: kitchener.memorial@gmail.com). Decisions about how the interpretive material will be displayed have not yet been made. 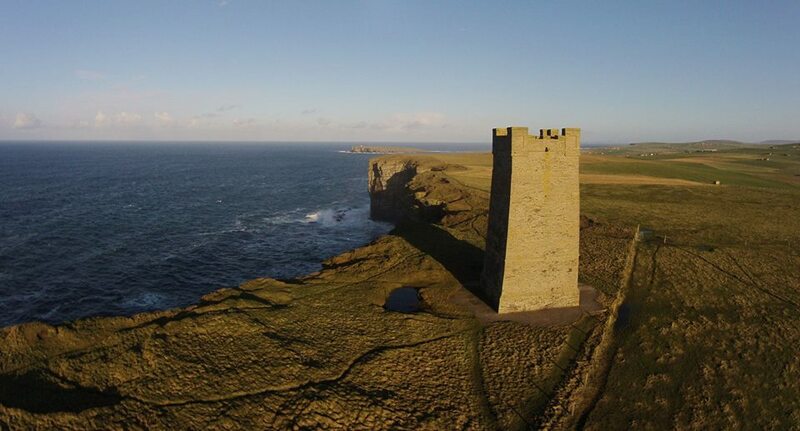 Orkney Heritage Society is undertaking the project as its contribution to the centenary of World War 1, to preserve the existing tower and to enhance the environment.